The successes of medicine and surgery did not lead to the considerable decrease of the number of patients with the purulent wounds, the purulent diseases of soft tissues and the postoperative purulent complications. In the case of the development of purulent complications at wound process assumes unfavorable flow, specifying the essential difficulties of treatment. Contemporary strategy and, to the larger degree, the tactics of the surgical treatment of purulent wounds determines two basic boundaries of this problem: first, it is valuable necrotomy, purpose of which - the creation of optimum conditions for the liquidation of wound infection and reparative regeneration; secondly - reducing operations for the purpose of the fastest closing of wound surface. However, between these stages frequently lies the significant time interval, during which local treatment is conducted. 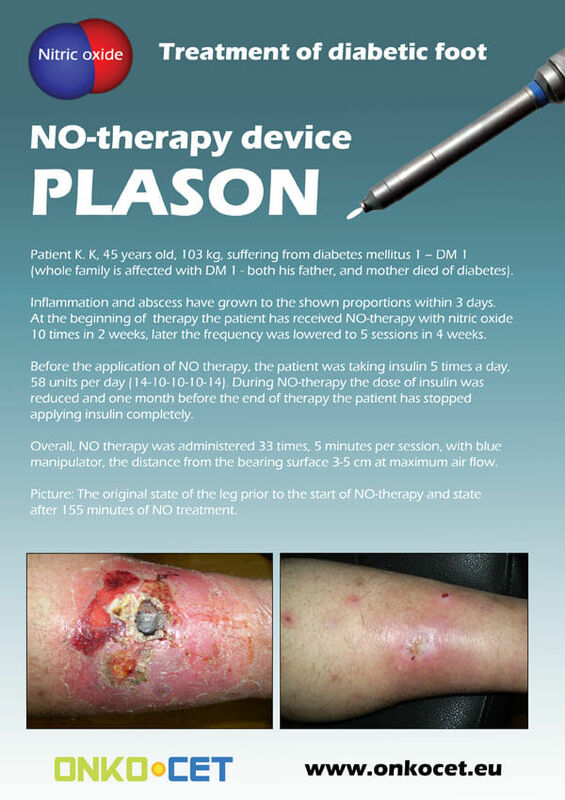 The effectiveness of the application of exogenous NO during the treatment of the experimental infected and purulent wounds they made it possible to use a method of NO-therapy in the clinical practice. Studies were carried out in a number of the clinics MMA i.n. 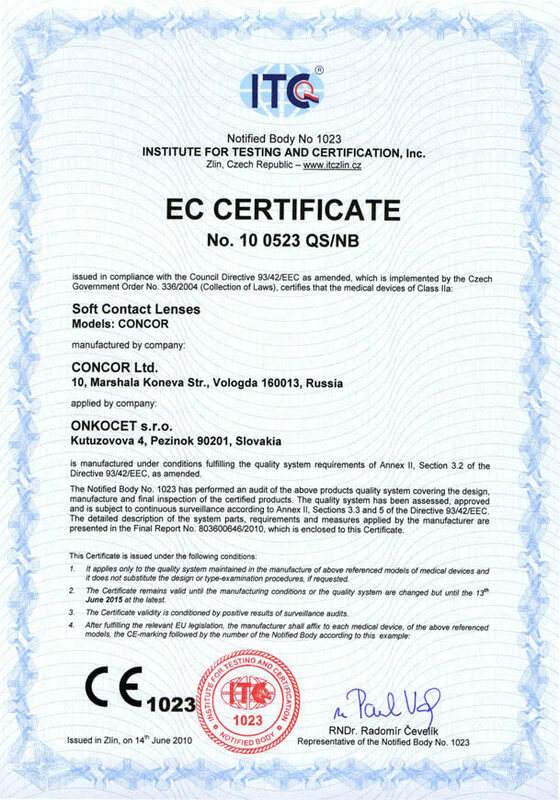 I. M. Sechenov, in SEC of laser medicine MoH RF, and also in a number of clinical hospitals. In the department of the general surgery MMA i.n. I. M. Sechenov on the base of CMH 23 n. “Medical workers' union” under the management of academician RAMS V. K. Gostishchev these studies were carried out in 220 patients with the purulent wounds of different etiology and in 104 patients with the phlegmonous- necrotic form of erysipelatous inflammation. Last disease is characterized by extremely heavy flow and frequent invalidization of the patients of working age. 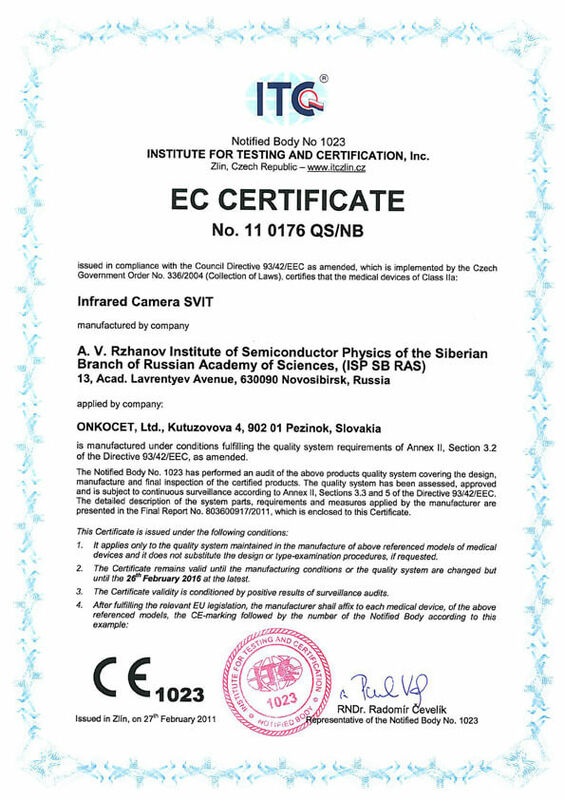 For the evaluation of results the complex of laboratory- instrument methods is used, which includes microbiological procedures, cytological and pathomorphological studies, study of microcirculation in the cloths of wound zone by the methods of laser doppler floumetry (“LAC - 01”, Russia), percutaneous oxigenometry (TSM-400 “Radiometer”, Denmark) and local skin thermometry (digital infrared temperature scanner OS -92, “Omega”, USA). Patients with the purulent wounds were distributed into 2 groups: 108 patients entered into the basic group (NO-therapy), into the group of comparison (traditional methods of treatment) - 112. In both groups the treatment began from urgent radical surgical treatment of purulent or pyonecrotic center with carving of all necrotized and nonviable cloths, wide opening of purulent flows and pockets. For the preparation of wound surface for the early surgical closing in the group being investigated the procedure of the treatment of wounds NO-CGF (with the concentration of the nitrogen oxide in the contact zone with the wound of 500 ppm) is used. During the I phase of wound process the working was conducted daily during 3-4 days, and upon transfer of wound process during the II phase - after one day, also after the surgical closing of wound surface. In total for the course 5 to 12 sessions were carried out, depending on the pattern of the flow of wound process. The mean time of NO-CGF influence on the wound was 30-60 seconds for 20 cm2 of surface. Maximum NO doses were used with the predominant phenomena of alteration and exudation, while with the phenomena of proliferation - moderated and minimal doses were used. The local treatment of wounds besides this included the use of antiseptics and ointments on the polyethylenglycol basis. In the patients of the group of comparison only traditional local treatment was used. The results of studies showed that at the beginning of the treatment the nature of local changes in the wounds corresponded to the I phase of wound process. The initial bacterial seeding of wounds by unspecific microflora composed 106-8 units/1g of cloth. Cytological diagnostics revealed during this period the predominance of the dystrophic and dystrophic- inflammatory types of cytograms. The studies of microcirculation by the LDF method showed the presence of the expressed disorders according to the hyperemic type with reduction in the index of the effectiveness of microcirculation (IEM) to 70-80% and sharp reduction to 2-15 mm Hg in the oxygen tension in the wound zone. Sharp decrease of exudation and perifocal inflammatory phenomena is noted already after 3 days of treatment in the basic group of patients after 2-3 sessions of NO-therapy. Microbial seeding was reduced to the level of 102-3 units/1g of cloth. The indices of microcirculation were improved with increase in the oxygen tension to 25-30 mm Hg and IEM on 20-30% lower than normal values. 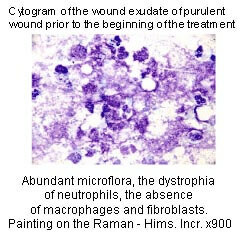 The predominant type of the cytograms of wound exudate was inflammatory- regenerative with an increase in the percentage of macrophages and fibroblasts in contrast to the group of the comparison, where microbial contamination remained and the dystrophia of neutrophils in bioptat during the histological study, the activation of macrophage reaction, the proliferation of fibroblasts, phenomenon of angiogenesis, the development of the centers of granulating cloth was noted. Decreased inflammatory infiltration and edema of cloth, and also the signs of the disturbance of microcirculation. To 5 days of treatment wound surface in the majority of the patients of basic group (90%) was completely cleaned of the necrotized tissues, was covered with bright fine-grained granulations. The cloths surrounding wound did not visually differ from healthy. The microbial seeding of wounds was reduced to 101-2 units/1g of cloth. Data of the integrated assessment of microcirculation showed in the majority of observations the restoration of capillary blood flow in the cloths of wound zone. The predominant types of cytograms were regenerative and regenerative- inflammatory with a notable increase of the fibroblasts in them - in average 18,5±3,1%. Morphological changes in bioptat consisted in the significant development of granulating cloth and its ripening. The boundary regeneration of the epithelium was sometimes noted. In the group of comparison analogous indices were observed only in 40% of patients, while in the bulk was noted only to 8-10 days from the beginning of the treatment. Thus, NO-therapy made it possible to liquidate wound infection in short periods and on 3-5 days to reduce the periods of the preparation of wound surface for the surgical closing. The effectiveness of NO-therapy during the treatment of the pyonecrotic form of erysipelatous inflammation, which patients relate to the heaviest contingent of the patients of purulent surgical departments, is especially significant. The group of observations was composed of 104 patients with phlegmonous- necrotic erysipelas: 54 patients in the basic group (NO-therapy) and 50- in the group of comparison. The area of the pyonecrotic defeat of soft tissues more than in half of the cases composed 200 cm2 and more. The prevalence of defeat determined gravity of the patients state. The procedure of NO-therapy and the methods of control were the same as during the treatment of purulent wounds. Prior to the beginning of the treatment of wound all observations were characterized by the high bacterial seeding (< 106 units/1g of cloth), the associations of microorganisms were seen frequently. The preferred types of cytograms were necrotic and dystrophic- inflammatory. Also the expressed disorders of microcirculation according to the hyperemic type and sharp reduction in the partial tension of oxygen in the surrounding wound skin - to 1-5 mm Hg were noted. To 5-7 days of treatment in the group of patients, who obtained local NO-therapy, in contrast to the comparison group wounds were cleaned in essence of the nonviable cloths, exudation and perifocal inflammatory phenomena sharply decreased, the centers of bright fine-grained granulations appeared. The bacterial seeding of the cloths of wound during this period was located on the level of 103-4 units/1g of cloth, predominantly in the monoculture form. The inflammatory- regenerative type of cytograms predominated. 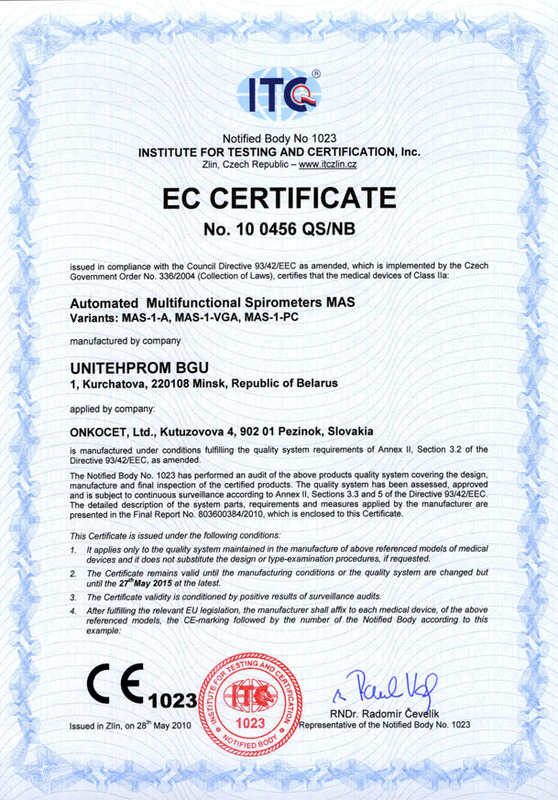 The histological study of bioptat testified the significant decrease of necrotic and pyoinflammatory processes in the skin and subcutaneous cellular tissue, proliferation of fibroblasts, increase in the granulating cloth, normalization of microcirculation. 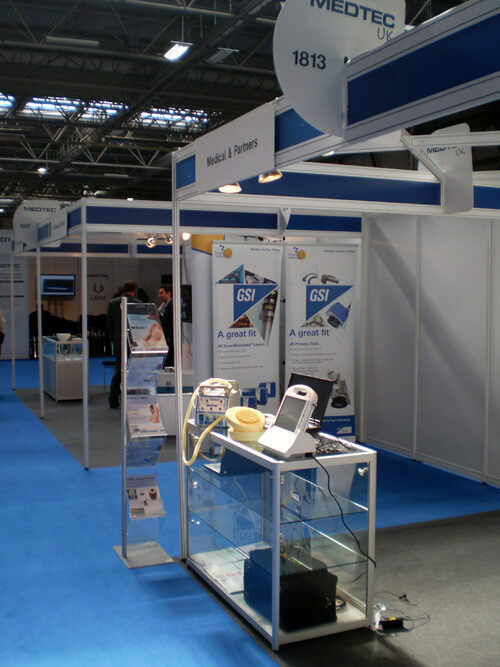 To 1-2°C it was, as a rule, lowered by LKT with an increase in the oxygen tension to 23-32 mm Hg data of LDF they testified about an improvement in local microcirculation, showing reduction in the index of microcirculation to 10-15 units, IEM in this case rose to 50-70% of the physiological values in the symmetrical zone. The calming of inflammatory phenomena is noted to 12-14 days from the beginning of treatment in the larger part of the patients of basic group (37 patients), wound discharge acquired serous nature, along entire superficial wound the growth of bright fine-grained granulating cloth is noted, which characterized the II phase of wound process. Bacterial seeding did not exceed 102 units/1g of cloth, in the smear impressions the regenerative- inflammatory and regenerative types of cytograms predominated, in bioptat significant acceleration of ripening granulating cloth and epithelization of defect was noted. The normalization of the parameters of microcirculation to this period also testified about the readiness of wound surface for the surgical closing. In the group of comparison it was possible to trace the analogous parameters in the majority of the cases only to 20-25 days from the beginning of treatment. Thus, the combination of radical surgical treatment of extensive pyonecrotic centers and local NO-therapy allowed in the majority of the patients with phlegmonous- necrotic erysipelas during 12-14 days to liquidate heavy pyonecrotic process and to create conditions for fulfilling the reducing operations. 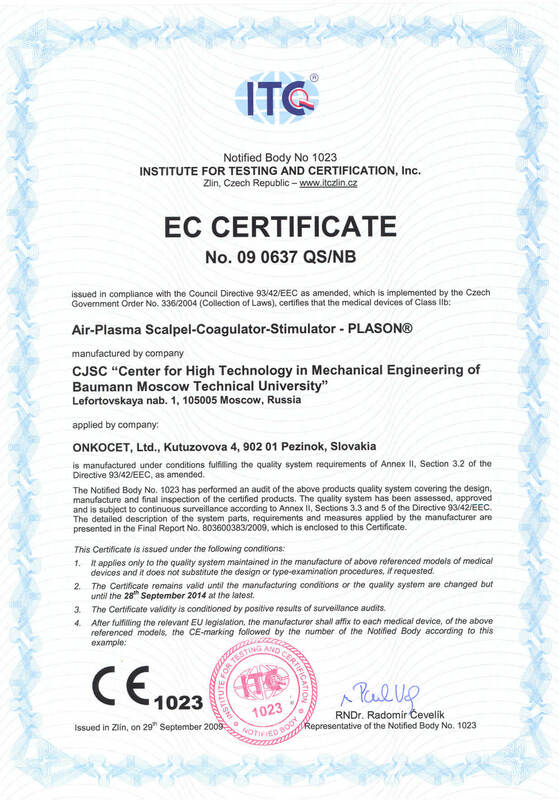 Especially large experience of the use of the new technology (air- plasma flows and a nitrogen oxide) is accumulated in the therapeutic establishments MoD RF - 3487 patients with the purulent surgical pathology under the conditions of hospital and 235 patients - in the dispensary- polyclinical practice. From 1995 until 1999 for these purposes the prototype of the apparatus “Hemoplaz AP” (in the regimes of destruction and coagulation) was adapted, and then - apparatus “PLASON”, which together with the destruction and by coagulation makes it possible to carry out NO-therapy. Purulent center underwent standard surgical treatment. After the opening of pyoinflammatory center the wound surface was finished by the air- plasma flow (APF) in the regime “destruction”, evaporating the remainders of wound of separable and necrotic detrite in the limits of viable cloths. Then working continued in the regime “coagulation”, achieving hemostasis and sterilization of wound surface. This working, as showed observations, possesses hemostatic, expressed sterilizing and analgesic effects, and also effect of biological barrier (averting re-infection) and resorption of the toxic products of wound discharge). Wound defect they took in after 3-5 days from the moment of surgical intervention (after 2-3 workings APF in the regime of the sparing coagulation). The primary- deferred seam is superimposed in 30% of cases (1046 patients), in 45% of cases (1569 patients) - early second seam, dermautoplasty of wound defect is executed in 12% of cases (418 patients). In the remaining cases small wound defects did not take in and they healed by second intention after several (5-7) sessions of NO-therapy. 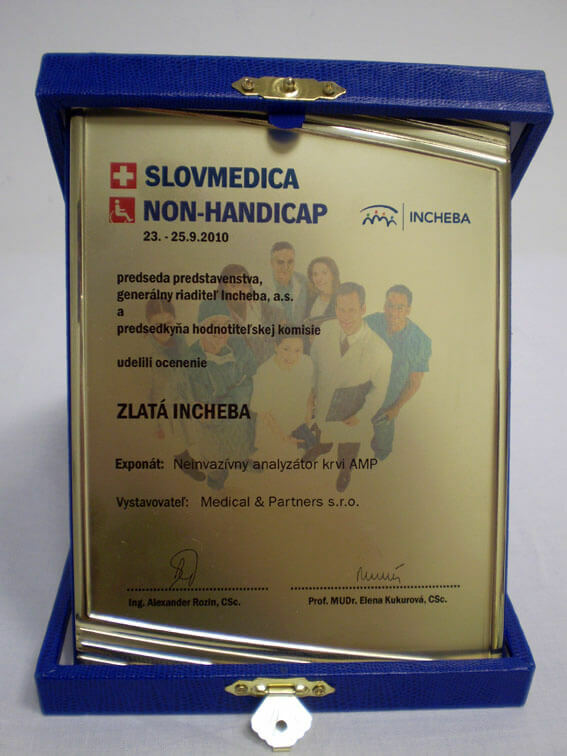 In 351 patients with the spread form of the anaerobic non-clostridial infection of soft tissues the treatment of wounds APF employing the same procedure made it possible in 100% of cases to take in wounds to 4-7 days. As a result healing according to the type of primary tension was achieved in 91% of cases (in the group of comparison - 82%), recurrent festering was observed in 9% of patients (in the group of comparison - in 18%). Lethalities and invalidization with the use of the new technology of treatment were not noted, while in the group of comparison they were observed in 6% and 8% respectively. The average duration of treatment was 17,8 days, and in the group of comparison - 29,8 days. New therapeutic technologies on the basis of use APF made it possible to reduce the I phase of the flow of wound process on the average to 5-7 days and within the earlier periods to carry out closing wound. After the fulfillment of the plastic stage of wound was processed paraxial along the line of weld and on the zone of dermoplastic in the regime of NO- therapy daily, which required 6 of 8 sessions in average. The combined method of action APF in the regime of the sparing coagulation and No- therapy made it possible in 97% of cases to attain the healing of wounds according to the type of primary tension, to reduce to 2-3% number of purulent complications and to practically avoid the rejection of autotransplants. NO-therapy is used as the basic method for the treatment of purulent surgical infection after the opening of purulent center in 13% of patients (454 men) with the area of wound to 10 - 15 cm2, which required on the average 6 - 9 sessions of working before the total epithelization. 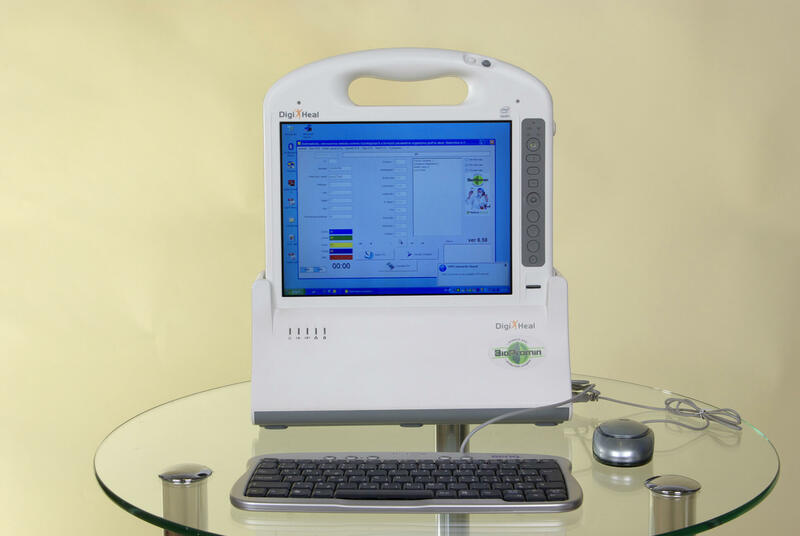 The experience of the use of the new technology - the combination of APF and NO-therapy - in 235 patients in the dispensary- polyclinical conditions also showed its clinical effectiveness. The procedure of treatment is analogous to above-described. On the average in 35% of cases (83 patients) after use APF in the regime of the sparing coagulation is superimposed the primary- deferred seam, in 25% of cases (59 patients) - early second seam, dermautoplasty of wound defect is executed in 2% of cases (5 patients), in the remaining cases wound defects healed by second intention. The combination of the regimes of coagulation and NO-therapy made it possible to reduce the periods of the healing of purulent wounds under the conditions of health center on 6 - 8 days. 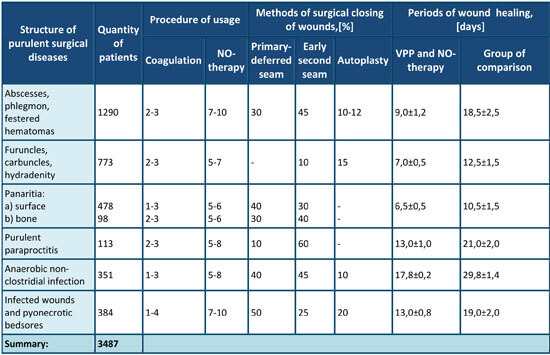 Thus, the results of treating the patients with the purulent surgical infection of soft tissues with the use APF and NO-therapy in the stationary and dispensary conditions make it possible to make a conclusion about the expressed clinical effectiveness of the new technology, which makes it possible to reduce the periods of the healing of purulent wounds on the average on 10-12 days, and to also avoid lethal outcomes and invalidization with the heavy and spread forms of this pathology.